Saturday 25th August 2012 was a very sad day when my uncle and friend Andy Duthie was taken home to be with his Lord and Saviour. I have so many fond memories, of “Uncle Andy” as I would refer to him from a very early age. Andy and Jean lived in Galashiels when I was younger and used to come back to Fraserburgh (the Broch) during the school summer holidays. Both Andy and Jean were teachers so there was always a long holiday (or so it seemed in those days) in the summer time when they would come north with Ruth and David my two cousins. It was, it seemed to be an endless time of picnics and other delightful summer activities. Later in my life Mary and I moved to live in Tweedbank ( near Galashiels ) when I started my first real job and this is where we started our family. We lived there for about 10 years where both Fiona and Linda were born – during that period we enjoyed many happy times in Andy and Jeans company, these were happy times indeed. 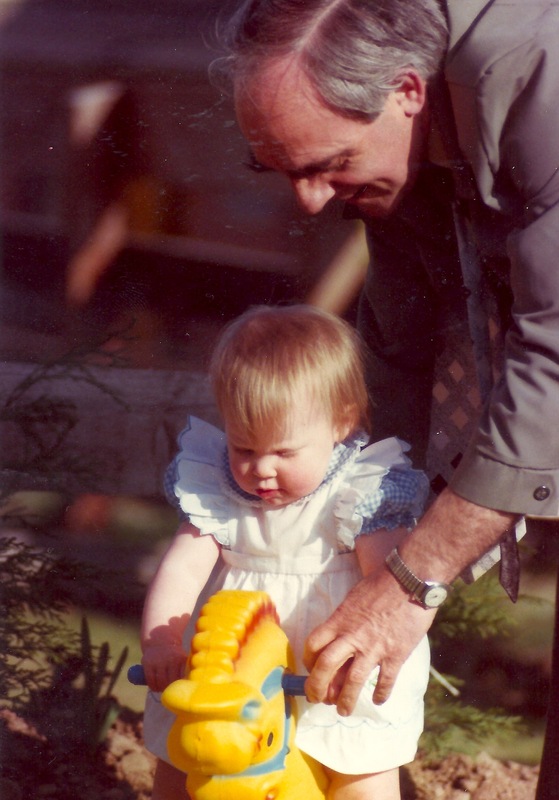 In this post I want to indulge in my own memories of my Uncle Andy from the earlier times. The first memory I have were many trips to the harbour when all the children would fish for podlies. 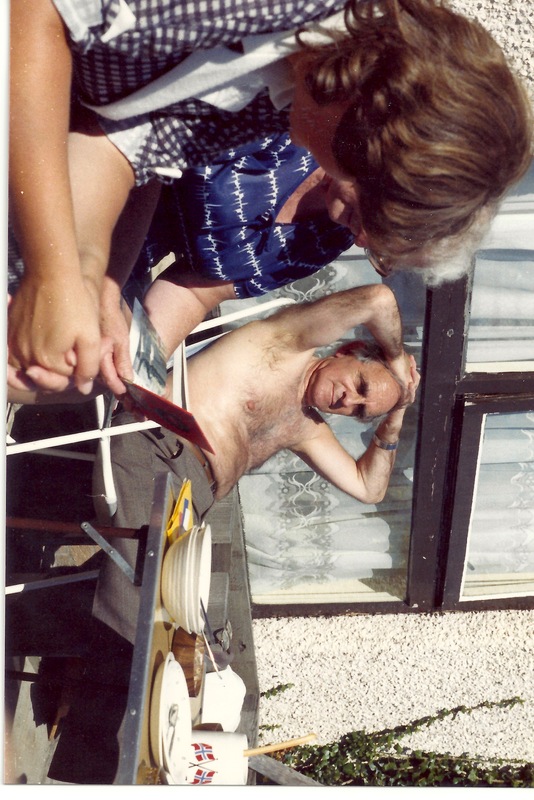 Another great memory was when Andy spent a winter in Galashiels building a sailing dinghy. He was a techie (technical subjects) teacher and built the boat from a set of plans. My grandfather (his dad) was a sail maker and he made the sails for the boat at Irvines sail loft. 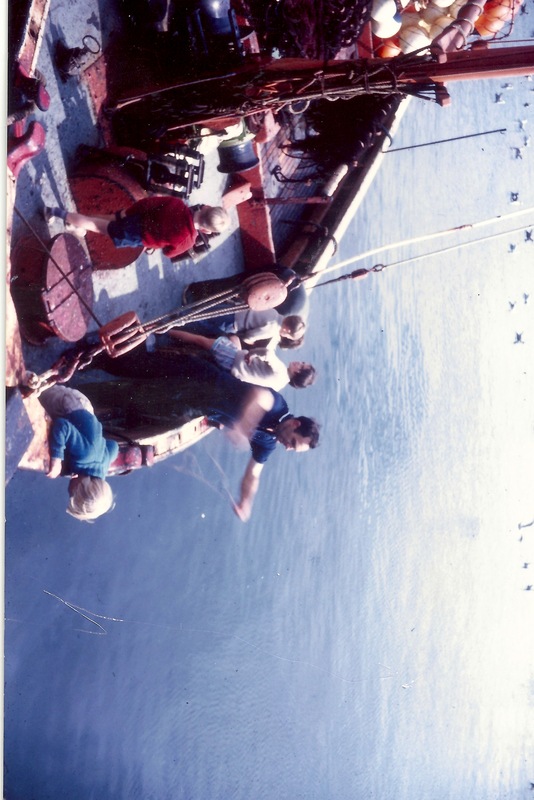 What excitement when Andy and Jean arrived in the Broch towing their trailer tent with the boat tied on top of it (this was to happen for quite a few summers from that time forth). I remember, as clear as day, my first “shottie” in the sailing dinghy which took place at Sandhaven harbour – a nice calm place to try out sailing for my first time (as I recall there was little or no wind – but we were happy none the less to have a sail). I remember very vividly how Andy was always so concerned and attentive to matters of safety. We had to wear a life jacket and he would also make us kids very aware of the risks of falling into the water! It was simply great fun and perhaps even resulted in a bit of character building that we had these opportunities to spend our summer days around the harbour or some other places sailing the dinghy. The trailer tent provided another strong memory from my childhood days. It was an Alpine Cruzer. I think it was imported from the continent and was quite unique. No one else seemed to have such a thing! Caravans were common enough and tents – perhaps frame tests – but a trailer tent seemed really special – I can to this day smell the canvas which seemed totally unique and conjured up a special sense of safety and warmth when in the tent. When the family came north with the trailer tent they would pitch it on the beach campsite for the duration of their stay. This lead to long and happy days playing down at the beach with Ruth, David and my own sister Elizabeth. 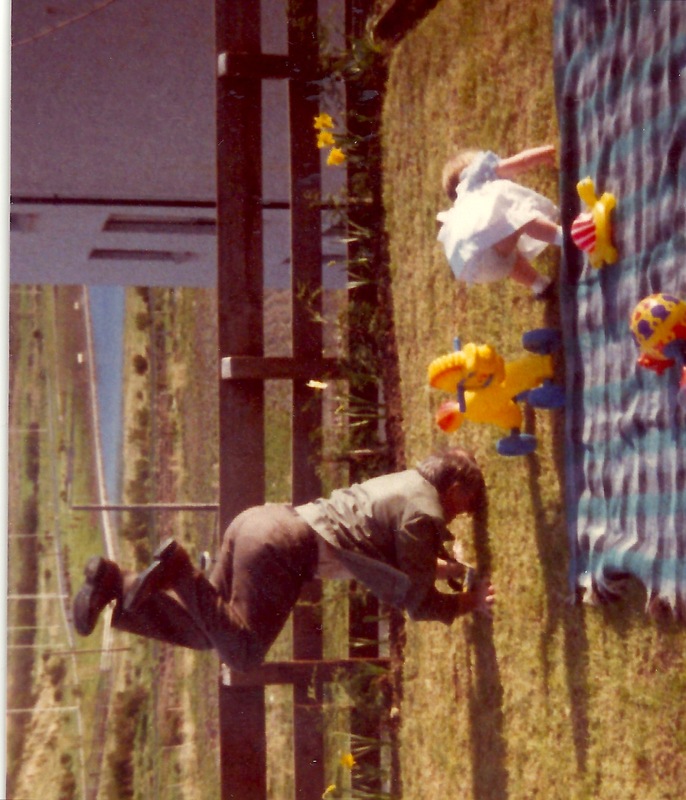 But I always remember Andy’s expert knowledge in all things camping – he was at the time a Scouter and knew all about which knot to tie for each and every occassion. In fact he would take every opportunity to satisfy our curiosity by showing us how !!! I still to this day use the “lorry driver knot” when I need to secure something to a trailer or roof rack. He also explained about “tent craft” and how you needed to look after the tent canvas and guy ropes etc. – this was particularly necessary in the transition between wet and dry weather to prevent undue tension as the guy ropes would dry out after the rain. I remember being on holiday – touring in France and Spain in that same trailer tent – but a most vivid memory for me would be at night when something would spark a bout of uncontrollable giggling and laughter!!!! When Andy got himself into this state the whole tent would shake until eveyone else was reduced to the same state!!!!! Sometimes we would find out the root cause of the hilarity – sometimes not!!! I know that Andy’s contribution to my learning was signifcant and think this was connected with the fact that he had a set of interests which were naturally close to my own. The friendship I developed for him was to become a life long one. Even up until a few weeks ago we would have conversations where we would discuss some point of interest. He was always keen to learn something new 😉 and was interested in just about everything. There is no doubt that I will miss his smile and our many conversations which covered so many different topics. He was my uncle who I used to look forward to seeing every summer and also became a genuine friend and confidant. Any time I needed to discuss a point of concern – I could always be sure that he would provide a listening ear and provide a degree of support in every case. He had a way of helping me to express my feelings and work out issues and come to the best conclusion with a manner which he never seemed to dictate the outcome. I will certainly miss this man but am so grateful to have known him for most of my life to date. I feel that he has been a solid influence throughout my life and I know that his influence has helped to form the person that I am today – of course the impact that he had on me is not singular but a force alongside a number of others. One thing I know we shared is our faith in God. Because of this, I know that we will meet again one day – I now look forward to that great reunion whilst in the mean time those of us who are left behind deal with our own sense of loss and separation. Topay it is Friday 31st August – the day of Andy’s funeral – this promises to be a difficult and emotional time for friends and close family alike. It should also be a day when people come together to pay their respects to Andy and remember his contribution in so many different contexts. It’s amazing how much you reflect on a the life of a good friend in the days leading up to the funeral. I have been doing just this amid all the other activies of work/travel etc. There are two other memories that I wanted to record today before we set of to the funeral. First, I recall the regular Tuesday evening excursion to Galashiels when I would attend the Gala Academy staff badminton club with Andy. I think he invited me to go to help “get to know” people ( and of course to play badminton). Mary and I would often walk in from Tweedband (or take the bus) and Mary would spend the evening with Jean whilst Andy and I would head of to the schools for a couple of your light hearted badminton – sometimes the games could be a bit competitive too of course 😉 Those were happy time indeed – we always finished of with a cuppa and Craigpark House before heading home. Later on – after the girls were born Mary and I exchanged roles and she would go to the badminton whilst I would look after the kids – I think that those badminton outings for Mary were a very special and enjoyable time which she kept going with Andy for many years. The other memory is quite a special one – Fiona reminded me of it the other day! This was Andy’s obsession with candles. It became a routine that each time we dinned with Andy and Jean at Craigpark House that Andy and Fiona ( and Linda too when she came on the scene) would head of around the house to find a candle (or two) to set on the table and light! This process often took place after the table was set and the food was ready to eat (much to Jeans annoyance)! But it had to be done!! 😉 He would say that this was important as it signified that Jesus is the Light of the World – which we should always remember as we sat down to eat our meal. Some one commented the other day that Andy passed away on teh same day that Neil Armstrong ( the first man to land on the Moon) did – Andy was a very curious person with a great interest of people experience of life 😉 We could just imagine the torrent of questions that Neil would be subjected to as Andy realised who he is as they walked together up to the gates of heaven. 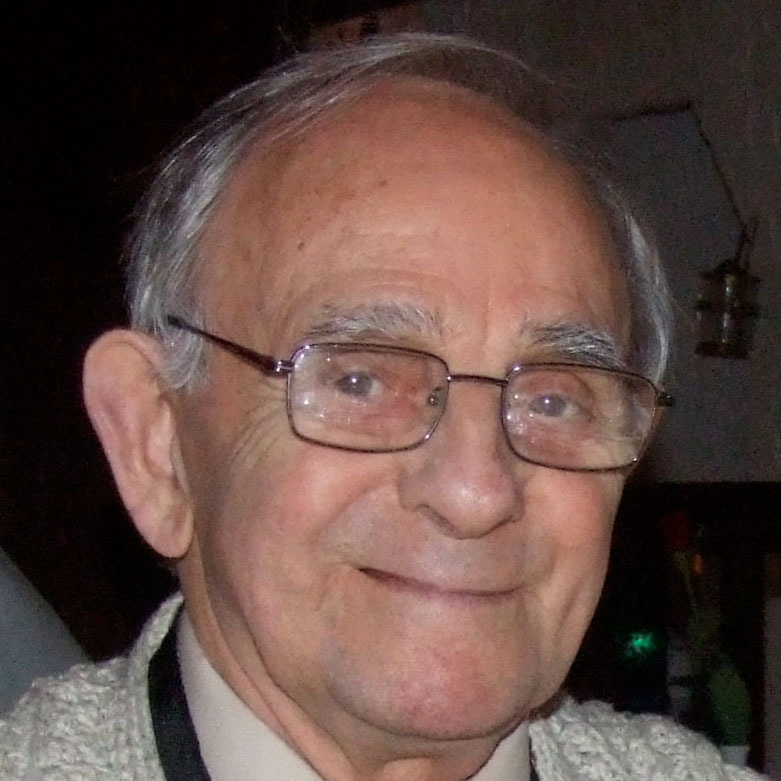 – This the Andy I will always remember – I feel so privildged to have had him as my Uncle and life long friend.